Bravo Company Gunfighter MCMR M-LOK Modular Rail Handguard 15"
Home > AR-15 Parts > Rails and Handguards > Bravo Company Gunfighter MCMR M-LOK Modular Rail Handguard 15"
Bravo Company's MCMR Handguard is a 13" long free floating handguard designed for modular accessories to mount directly to the M-LOK slots resulting in a lighter and less bulky weapon system. The M-LOK system allows a larger range of modularity offering 8 different offset mounting positions including the traditional 3,6,9, and 12:00 positions. Bravo Company's MCMR Handguard's proprietary patented mounting system is a mechanical index to the 12:00 rail and includes mounting hardware to prevent movement. Precision machined from Aerospace 6061-T6 Aluminum Alloy for strength and lightweight and Hard Coat Anodized per Mil-A-8625F, Type III, Class 2. Designed to be used with a carbine gas system with a low profile gas block or a mid length with an FSB. Includes a BCM M-LOK Sling Mount. 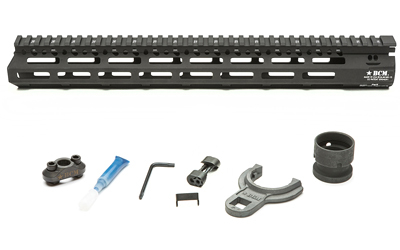 Bravo Company Gunfighter MCMR M-LOK Modular Rail Handguard 10"
Bravo Company Gunfighter MCMR M-LOK Modular Rail Handguard 13"
Bravo Company Gunfighter MCMR M-LOK Modular Rail Handguard 8"
Bravo Company Gunfighter MCMR M-LOK Modular Rail Handguard 9"